This past weekend, civic hackers gathered at the new Drexel ExCITe Center for the latest installment of the Random Hacks of Kindness hackathon in Philadelphia. In addition to a new location for this latest installment of RHoK, the event was organized by TechnicallyPhilly (in previous years, TechnicallyPhilly had been a collaborator and supporter of the event). The event was a huge success, with dozens of people turning out for the weekend to work on a great set of projects. You can read TechnicallyPhilly’s coverage of the event here. RHoK events in Philly always generate great projects like PhillySNAP and Sheltr, but I saw something really important and really exciting happening at this particular hackathon. The teams that took the top two spots at the event both had public employees as active members – the first place team was led by an IT manager from the Philadelphia School District. The second place team had members from the City of Philadelphia’s Department of Licenses and Inspection and the Managing Director’s Office. And the third place team developed an application that uses multiple open data sets published and maintained by government (transit information published by SEPTA and a list of SNAP retailers from the USDA). 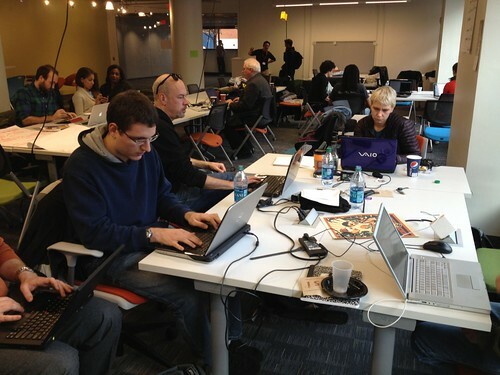 In Philadelphia – maybe more so than other places – the idea that open data and hackathons are a key part of building the services and solutions that can help government work better has set in deeply. I can’t think of one other city where public employees are as directly engaged in the civic hacking culture as in the City of Brotherly Love. This is a subject for a future blog post, but I think we’re at a pivotal point with government service delivery – at a place where a seismic shift in how governments deliver services and information to citizens is starting to occur. To me, it feels like we’re in a place like we were in the early 90’s, when the spread of the Internet forever changed they way the public sector provides services, and how citizens interact with their government. A massive and transformative change is coming – open data and civic hacking are important components helping drive it. And Philadelphia is going to set the course for other cities to follow.